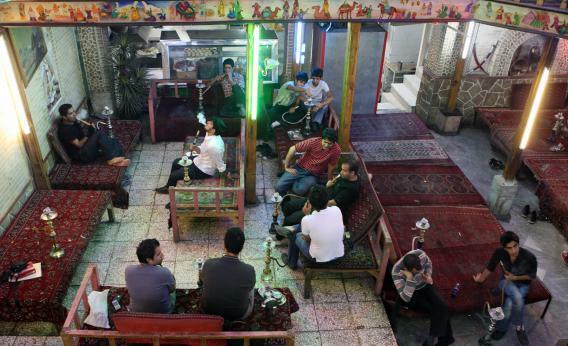 Iran faces backlash over "morality police" spying on coffee shops. When you meet a friend in a cafe, you don’t expect state security agents to be monitoring your every move. But that’s exactly what’s happening in Iran—as the country’s “moral police” force cameras into coffee shops to spy on young liberals. Since last year, the Islamic regime’s Basij forces have been targeting cafes because students and intellectuals meet there to share ideas often deemed “Western.” The Basij are under the command of Iran’s supreme leader and are tasked with carrying out a range of police functions—including suppressing dissident activity and making sure “morals” are not being breached. Previously the Basij were among a group of officers that in 2012 raided a reported 87 restaurants and cafes for “not following Islamic values,” such as by allowing women to smoke pipes in public. Now, the authorities are turning to a new tactic: surveillance. This became apparent last week, when one of Tehran’s most popular cafes, Café Prague, closed in protest after state officials had tried to force it to install a series of cameras inside its premises. We always knew this day would come and, in the midst of Tehran’s grimy winter, our end has finally arrived in spite of our many attempts to stay afloat. But as much as it pains us and as much as we will miss our friends and all of you who stood by our side in the past four years, we take comfort in knowing that we at least didn’t let Big Brother’s glass eyes scan and record our every step, minute and memory from dawn till dusk. The cafe’s closure is just the latest example of how tensions have continued to simmer in Iran since 2009, when protest swept the country following the disputed re-election of Mahmoud Ahmadinejad. Perhaps fearful of a potential Arab Spring-style uprising, the regime has increasingly turned to surveillance of its citizens. A Reuters investigation last year revealed Iran had in 2010 signed a deal for “a powerful surveillance system capable of monitoring landline, mobile and internet communications.” Meanwhile, the Islamic nation has been preparing an internal version of the Internet in part to limit outside influences.